Ishika and Abhinav’s picture-perfect ‘Malayali-Punjabi’ wedding included beautiful pre-wedding functions in the lush outdoors of the luxurious Taj West End, Bangalore. 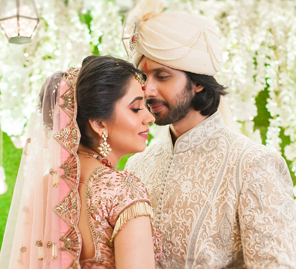 Ishika and Abhinav chose the Taj West End, Bangalore for their wedding because of its range of venues capable of hosting diverse events – from a traditional Malayali ceremony to an al fresco Arya Samaj wedding. Here, the bride shares highlights from the nuptials and pictures beautifully captured by WeddingSutra Favorite The Lightsmiths. “The first night, we hosted an intimate dinner for family and close friends at Abhinav’s grandmother’s home. Abhinav’s cousin Akshay runs Gallery Believe which is located on the property so the evening included a tour of the beautifully curated space, lots of great conversation, love and laughter. 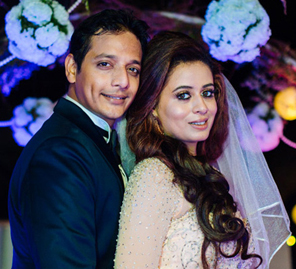 “The second morning we had separate ceremonies- Abhinav had his Dakshina ceremony while I had my haldi-chooda ceremony. Abhinav’s Dakshina (blessing ceremony) was held at his family home, decorated with my mother in law’s favorite flowers. He was to request for blessings from all his elderly relatives - aunts, uncles and 25 first cousins. It was a lovely morning filled with good vibes, love and blessings. My haldi-chooda ceremony was held at The Raintree, Taj West End. The venue gets its name from a 150 year-old rain tree that sprawls over the area. Our decorators strung it with tuberoses and kaleeras. We sat beneath its canopy as my Mama took my mehndi-filled hands and slid traditional red and white bangles that my Mami bought from Lajpat Nagar, Delhi onto my wrists. That was followed by my friends and family, tying the kaleere on my wrists, applying a paste of haldi and milk on my face and kneeling below a bunch of golden betel leaves to determine their future. It was a beautiful and relaxed ceremony, made sweet by mithai from my favorite Indian eco-friendly health-food store and cafe, Terra Earthfood. Meera from Terra Earthfood also helped us put together our in-room ‘wedding survival kits’: red rice murukkus, banana chips, wheatgrass besan ladoos, and filter coffee mysore pak. In addition to the healthier treats, we had the usual suspects: chilli garlic cashews, honey almonds, Oreos, Snickers, Bounty, chewing gum, electrolytes, Crocin, pudin hara and mosquito repellent drops. “The second evening began with Abhinav and I exchanging our vows, in private but in the presence of our amazing photo and video team The Lightsmiths, whom we definitely recommend to everyone, followed by a Mehndi party at the Blue Ginger Bar and lawns. The venue was decorated with an abundance of orange marigolds, pops of fuchsia from the linen, candles and hanging bulbs. We also had a sign that depicted our truth; ‘Mutual Weirdness Forever’, a basket of Jenga blocks for our guests to leave us messages on, bride-squad and groom-squad flash tattoos, custom-designed ‘I DO’ coloring books and crayons for our numerous nieces and nephews to engage in, and wedding favors that included colorful metal bangles and fun pocket squares by Julia and Sita. Our menu included all our favorite foods – from chana bhatura to grilled artichokes. We also designed our cocktail list to depict a perfect blend of Malayali and Punjabi flavors and spirits. This was probably our most fun evening. All of our guests danced with us and I fell in love with my husband’s dance moves all over again. 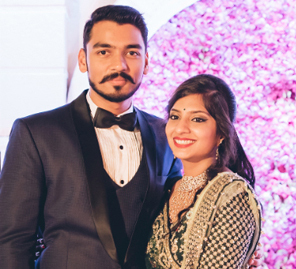 “We had our Malayali wedding the next morning in the Grand Ballroom of the Taj West End. I have never felt so much warmth and love. It was such a beautiful ceremony and Abhinav and I just felt so happy, grateful and blessed. Our mandap was decorated with chandeliers of yellow marigolds, traditional Malayali wedding features such as coconut flowers, banana leaves, the Ashtamangalyam lamp, Valkannadi and lots of thalams. One of the female Nadaswaram artists was playing the saxophone, a simply wonderful surprise! Abhinav wore a white shirt from Manish Ashutosh and a mundu our parents bought from Kerala. The men from the bride’s side wore Rajesh Pratap Singh shirts and mundus with velcro. “That evening, our Arya Samaj wedding was conducted on the Prince Of Wales Lawn. Arya Samaj stands for upholding truth and equality. 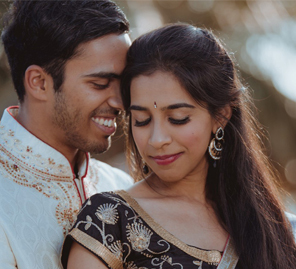 It was important to us that we understood the significance of our wedding ceremonies, which is why my sister Nitika spent a lot of time researching the roots of the Sanskrit words and mantras, to preserve the true meaning of the ceremony and we were able to recite the shlokas with genuine belief. We had these printed and placed on every chair for our guests to read. We are grateful for all our family and friends that were present to witness our love that is rooted in striving for equality. Instead of a Punjabi-style baraat, Abhinav’s side of the family organized a country boat (on wheels) from Kerala, on which Abhinav entered the lawns led by an electrifying performance by traditional Penchari Melam artists. Both of us really wanted to marry underneath a tree, and we are so thankful that we were able to do so. Abhinav wore a Manish Malhotra sherwani that was exquisitely embroidered with pearls, and bottle-green formal loafers that were very easily ‘stolen’ by my sisters. I wore an Anita Dongre red lehenga. I accessorized it with diamond and emerald jewellery to offset all that red, and Giuseppe Zanotti’s Betty. For all our pagadis, my dear friend Vaishali hand drew a marigold pattern she then got carved onto wooden blocks from a vendor in Hyderabad. She had a company in Chennai that works with the differently-abled and underprivileged to block print it on lotus pink and red mulmul fabric. After the Arya Samaj wedding came our sangeet at which our families and friends danced to Hindi, Punjabi and Malayalam music. This was followed by speeches and an after-party. I wore my wedding lehenga skirt, complemented by an Anita Dongre chiffon shirt instead of my wedding blouse. As a token of gratitude to our guests, we had Mickey from Ishika Tableware, design a salad bowl featuring a beautiful marigold and banana leaf pattern that our graphic designer Karishma created especially for our wedding. At the base of the bowl, we printed a poem that my Naniji used to read to me, that read: “We are all a little weird and life's a little weird, and when we find someone whose weirdness is compatible with ours, we join up with them and fall in mutual weirdness and call it love” - Dr. Seuss.